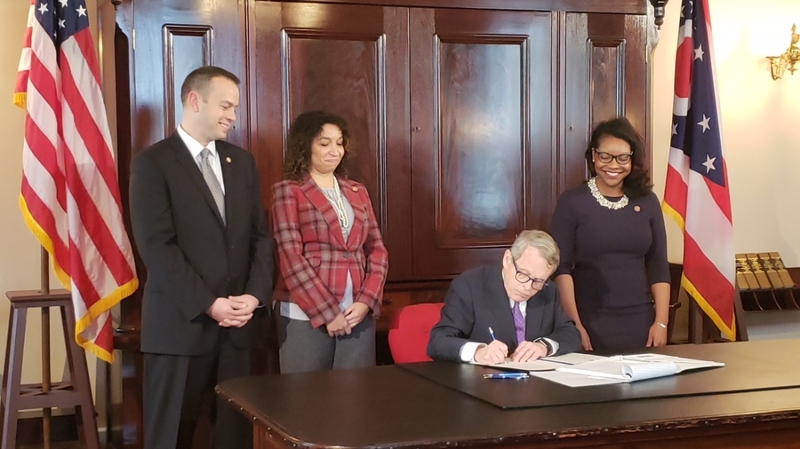 COLUMBUS—State Senator Nathan Manning (R-North Ridgeville) today joined Governor Mike DeWine for the signing of an executive order regarding Ohio’s workplace domestic violence policy in state government. The new policy mirrors changes in Ohio law made in House Bill 1, which was sponsored by Senator Nathan Manning last General Assembly. The bill expands the definition of domestic violence to include dating violence. "I am pleased to see that Governor DeWine is taking an extra measure to bolster protections for victims of dating violence in state government," said Manning. "This is another important step in helping to protect all victims of violence and abuse." DeWine's executive order requires all state agencies, boards and commissions to make available and maintain resources for survivors and offenders of domestic violence and take appropriate protective and corrective actions.